five children with Muhammad Yusuf Khan, a leader in the Jamaat-e-Islami political party, and resides in the city of Lahore.She died early in d morning today. At the age of 17, she wrote her first book on the life of a Palestinian refugee Ahmad Khalil. Maryam Jameelah wrote over 70 booklets and 17 books among them are "Western Civilization condemned by itself", "Islam and modern man", "Who is Maudoodi? ", "Orientalism", and "Western Civilizations and Man". Maryam Jameelah was born Margaret Marcus to a Jewish family in New Rochelle, NY, on May 23, 1934. She grew up in a secular environment, but at the age of nineteen, while a student at New York University, she developed a keen interest in religion. Unable to find spiritual guidance in her immediate environment, she looked to other faiths. Her search brought her into contact with an array of spiritual orders, religious cults, and world religions; she became acquainted with Islam around 1954. She was then greatly impressed by Marmaduke Pickthall’s The Meaning of the Glorious Koran and by the works of Muhammad Asad, himself a convert from Judaism to Islam. Jameelah cites Asad’s The Road to Mecca and Islam at Crossroads as critical influences on her decision to become a Muslim. Through her readings in Islam she developed a bond with the religion and became a vocal spokesperson for the faith, defending Muslim beliefs against Western criticism and championing such Muslim causes as that of the Palestinians. Her views created much tension in her personal life, but she continued to pursue her cause. She embraced Islam in New York on May 24, 1961, and soon after began to write for the Muslim Digest of Durban, South Africa. Her articles outlined a pristine view of Islam and sought to establish the truth of the religion through debates with critics. Through the journal, Jameelah became acquainted with the works of Mawlana Sayyid Abu Ala Mawdudi, the founder of the Jamaati Islami (Islamic Party) of Pakistan, who was also a contributor to the journal. Jameelah was impressed by Mawdudi’s views and began to correspond with him. Their letters between 1960 and 1962, later published in a volume entitled Correspondences between Maulana Mawdoodi and Maryam Jameelah, discussed a variety of issues from the discourse between Islam and the West, to Jameelah’s personal spiritual concerns. Jameelah traveled to Pakistan in 1962 on Mawdudi’s advice and joined his household in Lahore. She soon married Muhammad Yusuf Khan, as his second wife. Since settling in Pakistan, she has written an impressive number of books, which adumbrated the Jamaati Islami’s ideology in a systematic fashion. Although she never formally joined the party, she became one of its chief ideologists. Jameelah has been particularly concerned with the debate between Islam and the West, an important, albeit not central, aspect of Mawdudi’s thought. Her significance, however, does not lie in the force of her observations, but in the manner in which she articulates an internally consistent paradigm for revivalism’s rejection of the West. In this regard, her influence far exceeds the boundaries of the Jamaati Islami and has been important in the development of the Muslim world. The logic of her discursive approach has recently led Jameelah away from revivalism and the Jamaati Islami. Increasingly aware of revivalism’s own borrowing from the West, she has distanced herself from the revivalist exegesis and has even criticized her mentor Mawdudi for his assimilation of modern concepts into Jamaati Islami’s ideology. Her writings in recent years embody this change in orientation and reveal the influence of traditional Islam. Today she lives in Lahore and continues to write on Islamic thought and life. "While i was scanning your essays. I felt as if i were reading my very own ideas. i hope your feeling will be the same when you have the opportunity to learn Urdu and study my books. And that despite the fact there has been no previous acquaintance between you and me, this mutual sympathy and unanimity in thought has resulted directly from the fact that both of us have derived our inspiration from one and the same source-- Islam "
The authority of Islaamic Morals and Laws proceeds from Almighty God. Pleasure and Happiness in Islaam are but the natural byproducts of emotional satisfaction in one's duties conscientiously performed for the pleasure of God to achieve salvation. In Islaam duties are always stressed above rights. Only in Islaam was my quest for absolute values satisfied. Only in Islaam did I at last find all that was true, good, beautiful and which gives meaning and direction to human life and death. 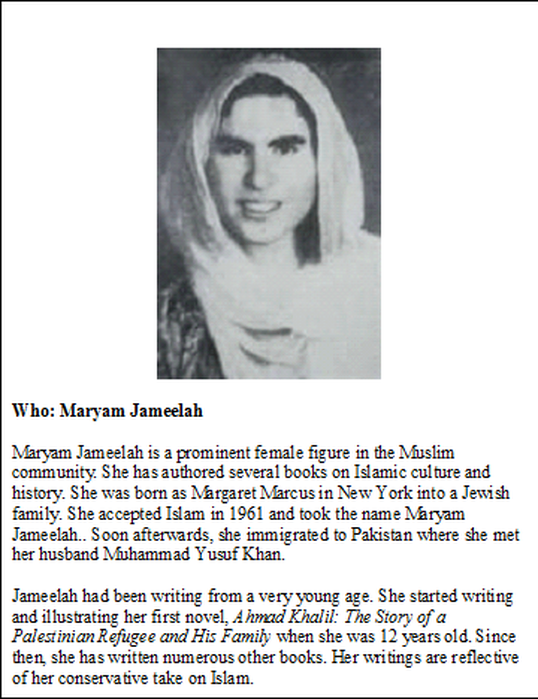 The story of Maryam Jameelah is an extraordinary but painfully confused true tale of a young American woman whose search for moral absolutes and emotional security led her to abandon a middle-class Jewish upbringing in suburban New York in the 1960s for a vastly different existence as an exile and convert to Islam in Pakistan, where she experienced both great intellectual productivity and deep personal conflict. Deborah Baker, who based her account of Jameelah’s life largely on troves of correspondence (which Jameelah gave her permission to use), calls her story a parable of Islam and America. But it is hard to find a clear lesson in a life whose multiple twisted strands have included bouts with mental illness, family conflicts, irreconcilable loyalties to rival faiths and versions of history, and ultimate disillusionment in a search for impossible certainties about life and death. There is much to admire in Jameelah, especially her determination and idealistic belief in justice and a better world, which inspired her writings and drove her relentlessly — sometimes violently — to denounce what she saw as evil. At age 11, a bookworm with heroic fantasies, she wrote that she planned to become a “missionary to the Arabs. Not to convert them, but to make sure they stay just as they are.” At 14, she dreamed of a “new golden age” where Arabs and Jews would live in harmony, as they had in medieval Spain. 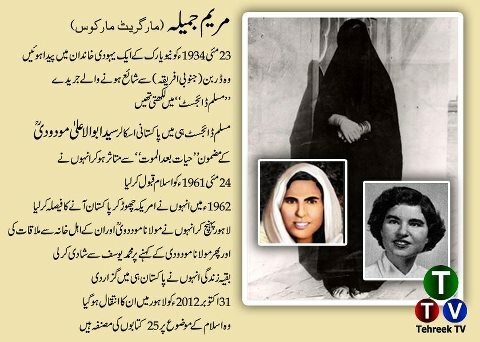 In May 1962, a 28-year-old New Yorker called Margaret Marcus set sail for Pakistan to live the life of a Muslim in the household of Maulana Mawdudi – ideologue and leader of the Islamic political party, Jama’at-I-Islami. For the next 30 years, in vivid and chatty letters to her parents back home, Margaret Marcus, or Maryam Jameelah, described her life in Lahore and the reasons for her embrace of Islam. Jameelah would go on to write a highly influential set of books that attacked Western secular materialism and upheld a life lived by the laws of the Holy Qur’an. She would become the first person to consistently critique Western civilisation from within the paradigm of Islam. Margaret Marcus as Maryam Jameelah. DEBORAH BAKER’S new book, The Convert (from which the following excerpt is taken), tracks the astonishing journey of this radical woman and explores the philosophical basis of the dream of an Islamic nation. The Convert is forthcoming from Graywolf Press. I am glad to know you have accepted my counsel and are ready to come to Pakistan. I pray to Allah that He may guide you to what is right and in your best interest. I think it is advisable to mention a few things. As you must already know, our way of life and social conditions are vastly different from those in America. We lack many facilities and amenities that Americans take for granted. Therefore, the first months here will certainly prove fatiguing and taxing upon your nerves. Unless you have patience and are resolutely determined to mould your life according to ours, to live and die among your Muslim brethren, you might find it extremely difficult to reconcile yourself to our ways. Although I will try my best to look after your needs and make things easier, your steadfast cooperation is essential. Two of my daughters are near to you in age. One is studying for an MA in English and the other a BA in Economics. I hope they will make friends with you, teach you Urdu and in exchange, learn from you the enthusiasm of a new convert. My wife does not know English. Initially, this may hinder your intimacy with her but I hope you will pick up enough Urdu within two or three months to enable you to communicate. After you have learned Urdu, it will be relatively easy for you to learn Arabic, because these languages share vocabularies. In due course, I will also try to arrange for an Arabic teacher. As regards marriage, I will not pressure you but should you decide to marry, I will try to help you choose a suitable life partner. Naturally you will want to be married to a youth who lives as a good Pakistani Muslim. If you choose not to marry, I am prepared to welcome you forever as a member of my family. I am inviting you to share my hospitality in the spirit with which the early Muslim inhabitants of Medina had extended their invitation to their forlorn brethren outside of Medina and I wish you to respond with a similar spirit of migration, thinking that bonds of faith are firmer and stronger than relationships of flesh and blood. There is still another reason why you should postpone any decision about marriage. When you arrive, my wife will train you in how a Pakistani Muslim wife runs her home and manages her household affairs. This knowledge will stand you in good stead when you are facing married life. For such a marital relationship to achieve success, it is essential to learn the social etiquette of Muslim families. When you reach Lahore, daytime temperatures average well over 100 degrees F. Our houses are not air-conditioned but we do use electric fans. Eventually you will become accustomed to our tropical seasons but you must be prepared to bear the first onslaught of this extreme climate. You should bring with you all necessary belongings. Due to heavy customs duties, foreign products are very expensive here. Do not assume that such things can be easily replaced. I am writing a separate letter to your parents. I advise you to introduce me to them yourself and show them some of my letters so they may be able to grasp fully the background of my present letter to them. I am grateful for your kind letter of April 18th, extending to my daughter, Margaret, an invitation to live in your home. My wife and I are deeply moved by your gracious offer of hospitality. Since embracing Islam, particularly as an ardent convert, it seems that living in our society presents practical difficulties. Margaret is eager to accept your invitation and as her parents, we are ready to give her our consent although it means going to live in a distant land. Especially in view of the zeal she has shown, we are hopeful this would give her the opportunity for a happy and meaningful life. Coming to a country with such a different culture will surely require much forbearance during a period of adjustment. With the sympathy and understanding indicated in your letters combined with Margaret’s ardor, I am confident that her entrance into your family life will be successful. I was pleased to note in your letter to Margaret the advice regarding change of citizenship and marriage. 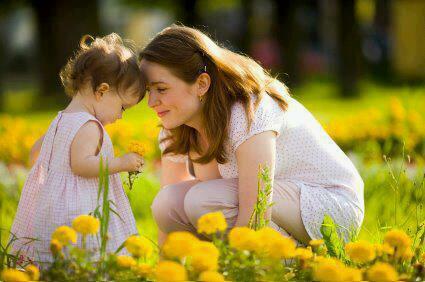 It is my paternal wish that she took irrevocable steps only after a reasonable period of residence. She goes to your country with our blessings and we shall maintain our continuing interest in her welfare. Therefore please feel at liberty to write to me about her at any time. Mrs. Marcus joins me in conveying to you, your wife and children our heartfelt gratitude.